On July 1st 2017, the Canadian Museum of History (CMH) opened the doors of its new permanent exhibit – the Canadian History Hall – to the public. When the museum’s name was changed from Canadian Museum of Civilization to CMH and a remodelling of the Canada Hall was announced in 2013, concerns grew among historians and museum curators that the then Conservative government would implement a narrow vision of the past. Fears that the new exhibit would erase the broad social history narratives of the old museum, however, did not come to pass. Quite the contrary, the exhibit now features an even broader approach and includes more perspectives from Indigenous peoples and visible minorities. The old Canada Hall, which closed in 2014, comprised a set of life-sized walk-in dioramas focusing on different spaces and time periods of Canadian history. Starting with Viking settlements in Newfoundland around 1000 AD, each segment showed a scene further west during a later period. Thus, starting in Newfoundland, visitors progressed through an eighteenth-century Quebec town and on towards an exhibit depicting the Vancouver airport in the 1960s. Many artefacts were presented in the context of their use – often together with other artefacts – in the dioramas rather than isolated in showcases. Though the exhibit included non-Euro-Canadian histories such as Asian Canadian immigration and Métis peoples’ life on the prairies, it implied that Canadian history started with the arrival of the first Europeans; it hardly covered Indigenous history before the seventeenth century. For the new exhibit, the curators did not need to start from scratch. Unlike the curators at the Canadian Museum for Human Rights (CMHR), CMH staff could draw upon a very large collection of artefacts, photographs, and audio-visual material that the museum – and its predecessors – have collected since the mid-19th century. It is surprising how much the style of the CMH and the stories told have changed while drawing on what are essentially the same artefacts. 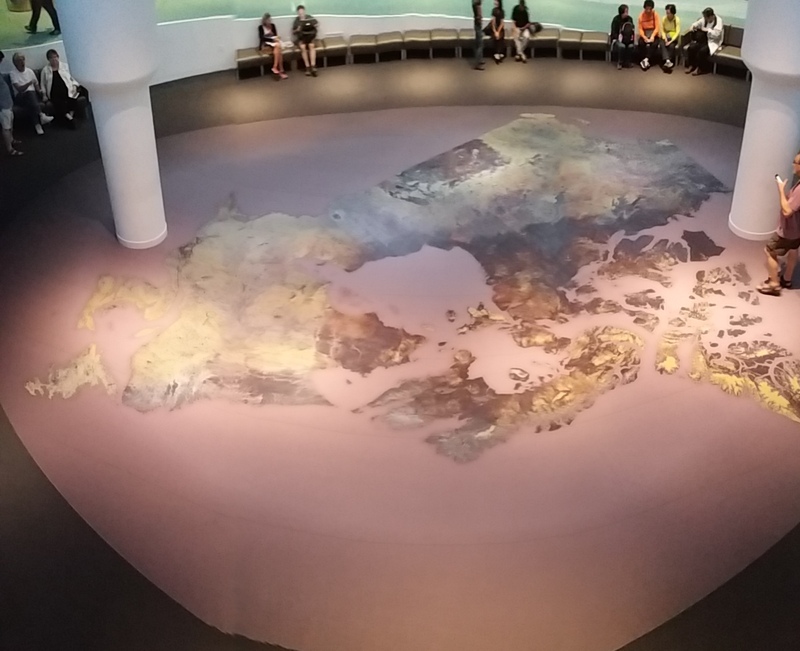 Entering the new Canada Hall, visitors begin with the land itself: a large physical map of Canada on the floor of the central open space of the exhibit. Starting from this map, which does not include any sign of human interference, such as borders, settlements, or place names, visitors begin to think about how humans have shaped the land. The Hall then directs visitors into one of three galleries, which are divided chronologically: early Canadian history until the British conquest in 1763, the formation of the Canadian state in the context of the British Empire between 1763 and 1914, and modern Canada. Each of the galleries is organised into six “stories” that are primarily organized temporally, but some stories focus on special aspects of Canadian history. These thematic stories are most prominent in the third gallery and include among other subjects Indigenous peoples, the role of Quebec, and diversity and human rights. One of the most noticeable changes of the display, is the stronger focus on Indigenous history and the role of visible minorities. 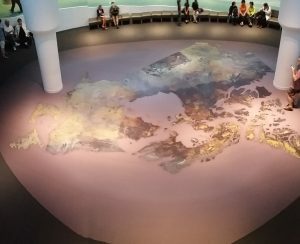 Thus, the new Canadian History Hall starts with an Anishinabe creation story and archaeological artefacts that predate the arrival of the first Europeans. Additionally, the segments on non-Euro-Canadian histories are not restricted to one place but are arranged throughout the entire exhibit. Thus, they show that Indigenous history is not detached from Canadian history but is an integral part of it. The second gallery, for example, features three segments on Métis history at different parts of the display: Métis life and culture in the first half of the nineteenth century, pursuit of self-government in 1869/70, and the resistance of 1885 and the trial of Louis Riel. This third segment also serves as an example of how the curators have confronted controversial parts of Canada’s past, explicitly raising questions about the role of the state in bringing them about. While these aspects used to be featured less prominently, controversial topics like the destruction of Africville, the 1919 general strike in Winnipeg, and the residential school system, show that the exhibit critically questions Canadian history and therefore is much more than just a celebration of 150 years of Canadian confederation. Like the stories told in the new Canada Hall, the style of the exhibit has changed significantly. The only part of the old exhibit kept on display is St. Onuphrius Church, an original early-twentieth-century Ukrainian church from the prairies; all life-sized dioramas have been dismantled. Many of the artefacts are presented in showcases and are accompanied by rather detailed texts – perhaps too long for some visitors. For some artefacts, replicas which can be touched by visitors are integrated into the exhibit. Probably for reasons of conservation, the artefacts are only dimly lit and most texts are in white print on a dark background. Because of this dim lighting, visitors’ eyes need a rest after a while. One way to of re-focusing is to engage with one of the several interactive elements in the exhibit. These include, for example, a game in which two players face each other as eighteenth-century British and French fur traders, printing nineteenth-century political pamphlets on responsible government, or participating in the 1960s flag debate by designing a new Canadian flag. Additionally, the exhibit features several audio elements; some of which can be controlled by visitors. However, there are relatively few interactive elements so that queues might form. Therefore, the exhibit might benefit from installing more interactive elements. Although the exhibit addresses many aspects of Canadian history, it does not and cannot address each and every aspect of it. In the future, new research, a change of focus in the public debate, or simply events that have not happened yet might call for changes in the exhibit. The museum is prepared for this: First, in contrast to the old exhibit, the new Canadian History Hall is built with a modular structure which would make exchanging segments easier. And second, room has been left to grow. There is still space in many of the 18 modules, allowing curators to add to the exhibit without having to dismantle parts of the existing exhibit. Overall, the new Canadian History Hall is a very good addition to the museum. The focus of the display is still on social history but it is presented less like a straightforward tale – as it was in the old exhibit – than as diverse and sometimes contradicting stories and experiences which are as diverse as the people who live in Canada. Additionally, it addresses negative aspects of Canadian history and conflicting interpretations to a much greater extent than the old Canada Hall. Most importantly, though, perhaps the greatest feature of the new exhibit is how it encourages visitors to actively engage with Canadian history rather than consume a prepared narrative. Visitors are encouraged to visit the new Resource Centre on the ground floor to engage further with Canada’s past. It remains to be seen how well visitors will accept the invitation to form their own opinion about Canadian history. Christoph Laugs is a doctoral candidate in history at the IRTG Diversity, Universität Trier in Germany. I visited the exhibit several times on different weekdays in late September. At these times, there were relatively few visitors and I had to wait at only a few of the interactive elements (the fur trade board game was always busy). Yet, this might be different on weekends. An example for such a change in the public debate is Vimy Ridge: Whereas the 1917 battle used to be remembered in the context of the large number of fallen Canadian soldiers, in recent years, governments and museum exhibits have suggested that it was a military victory that defined Canada as a nation [http://activehistory.ca/2016/07/vimy-ridge-and-canadian-nationalism/].